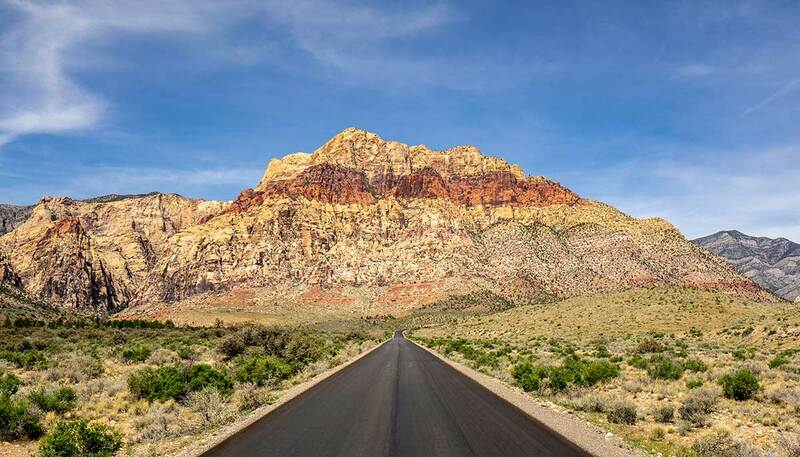 For those who think Vegas means The Strip, smoky casinos, and overpriced shows, you might want to consider something different — fresh air, colorful mountains, and views that cost absolutely nothing. 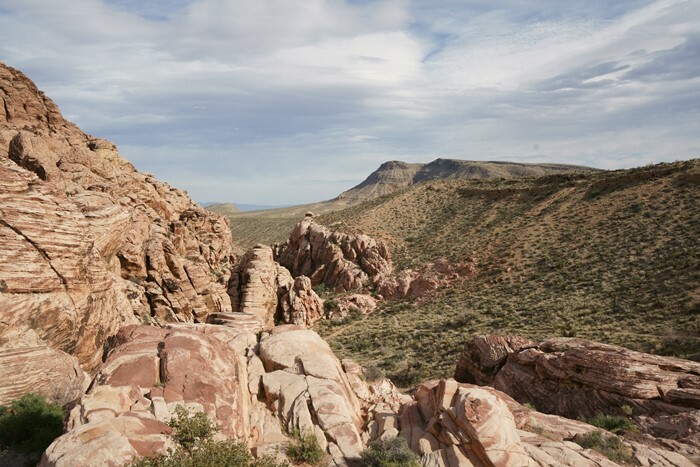 You can find them all, just a short drive from the heart of Sin City, at the Red Rock Canyon National Conservation Area. It’s essentially a small National Park packed with hiking trails and Instagram-worthy photo opportunities. The scenic drive requires an admission fee. As of 2018, it’s $15 per car, $10 per motorcycle, or $5 per pedestrian. National Park annual passes ($80) are also accepted. I’ve been to Las Vegas many, many times, usually using it as a launching-point for travel into Utah or Arizona. 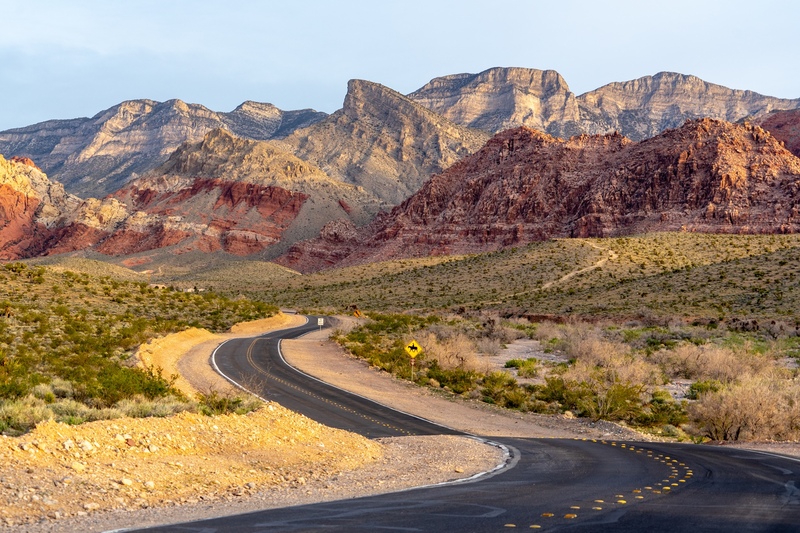 I never took the time to drive over to the west side of the valley, and check out Red Rock Canyon — and that was a big mistake. I’ll break down several excellent hikes on the next few pages, but on this page, I’ll give you an overview of what you can see in just one afternoon. … providing a display of swirling red, pink, and white colors. From two parking areas, you can hike down into the rocks, or hike alongside them as you head up the canyon. 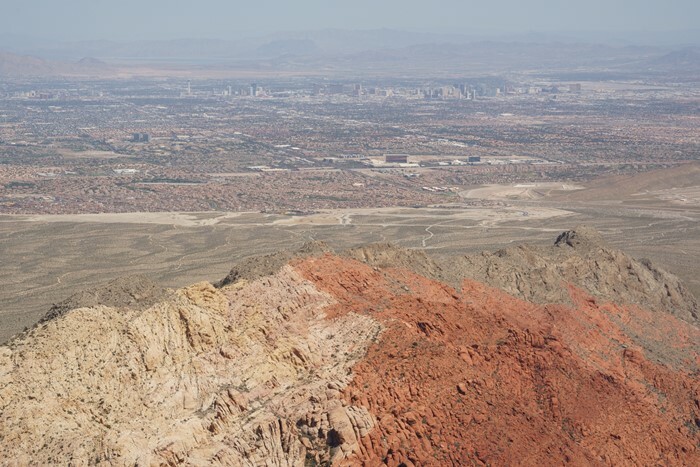 … the Calico Tanks Trail, which leads to a couple of pools of water, and eventually a great view of Las Vegas. 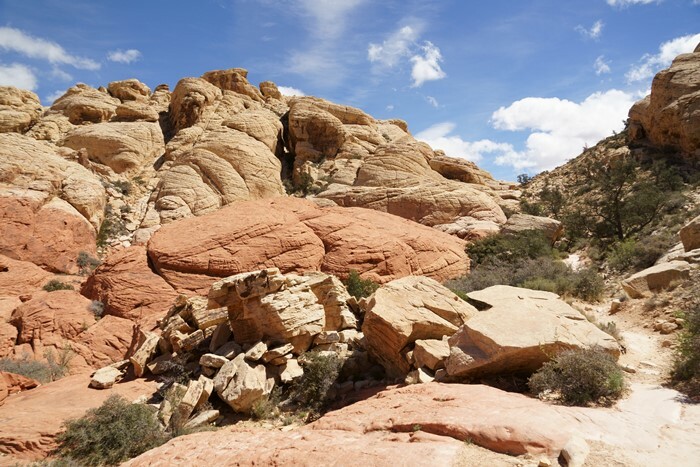 Here’s a breakdown of the entire Calico Tanks hike. 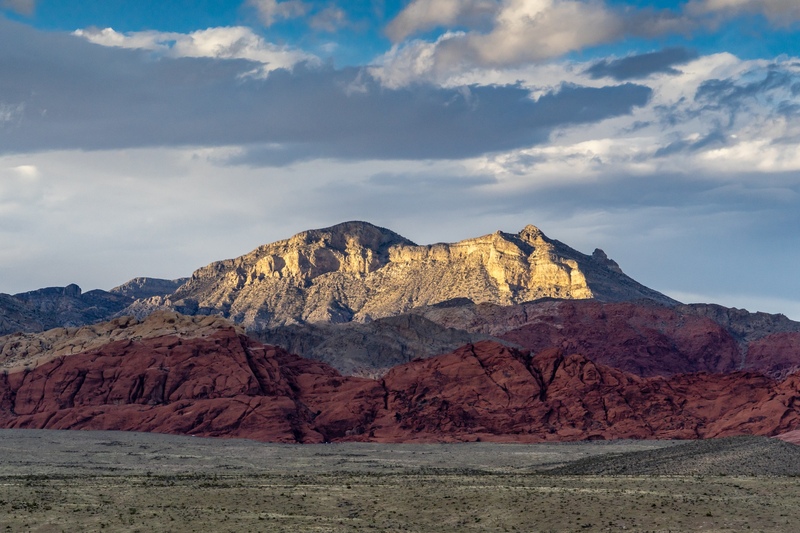 From the quarry, you can also hike up the distinctive mountain up ahead of you — Turtlehead Peak. Read about the entire, grueling hike here. About halfway around the loop, you’ll reach the road’s high point. 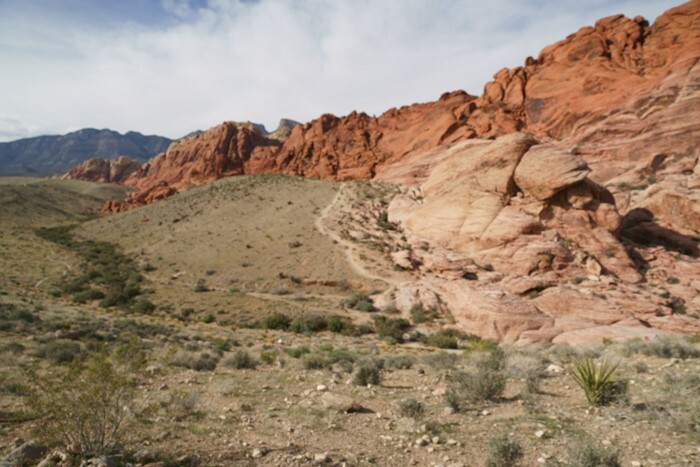 There’s a turnout here that allows you to take some photos of the entire Red Rock Canyon. 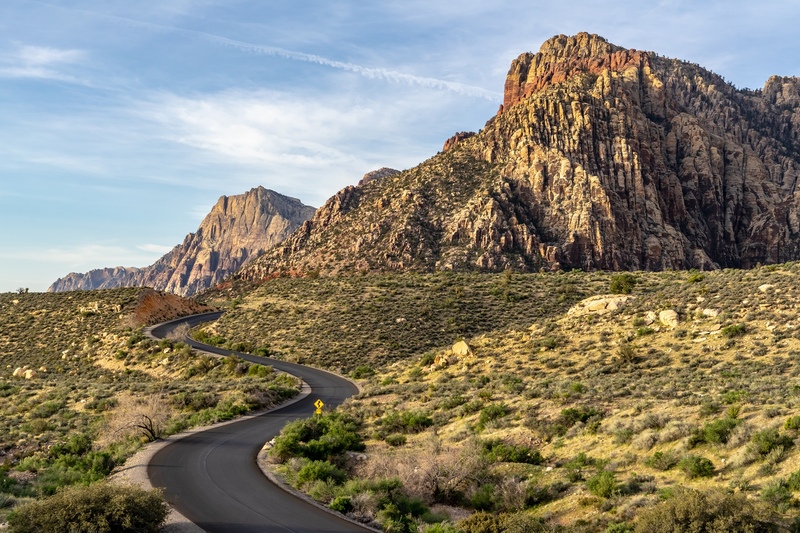 Continue the scenic drive, and you’ll be treated to views of the winding road, like this one, as you approach the trails on the southwest side of the canyon. 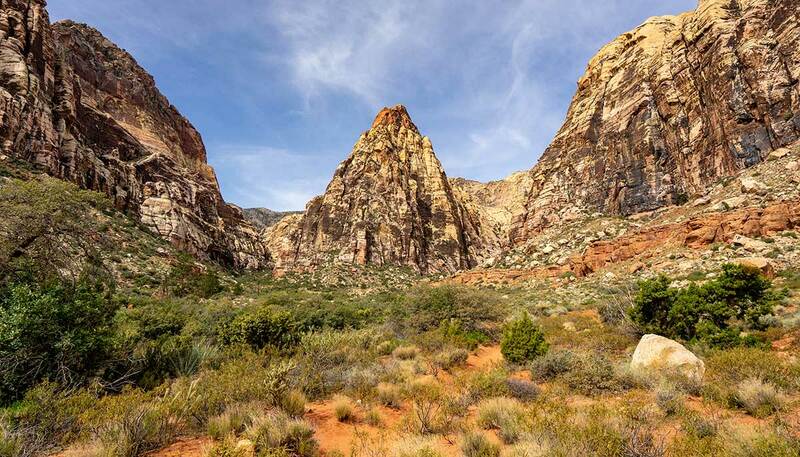 Thanks to the shade, the hike into Ice Box Canyon can be a cool choice in the summer, but you’ll still work up a sweat. It’s short, but very challenging, with lots of boulder-hopping along the way. At the end, a series of pools and waterfalls are very beautiful, but climbing up to the higher ones can be tricky. 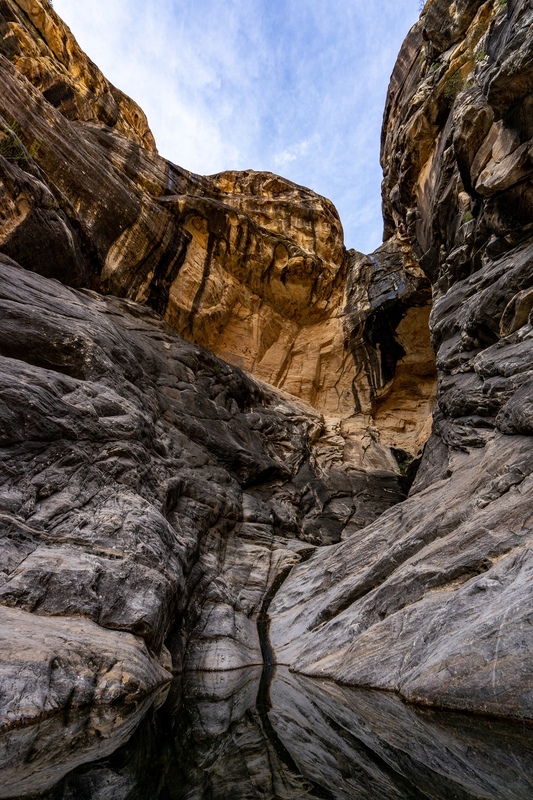 Check out the Ice Box Canyon hike here. Pine Creek Canyon is a much easier hike. The colors here really come to life during the morning and midday, when the sun floods the canyon. You’ll hike across open desert into the canyon, directly underneath that pyramid-shaped peak in the middle. Check out the Pine Creek Canyon hike here. When you reach the end of the scenic drive, don’t forget to glance in your rear-view! You’ll see this stunning view of the road leading directly into the mountains. This view is best in the morning – by late afternoon, the sun is behind these mountains, and the colors aren’t nearly as vivid. I was looking for a good place to watch the sunset at Red Rock Canyon, so I decided to try my luck at the Red Rock Overlook. It’s located on Highway 159, outside the scenic loop road, so you can stop here without paying the park entrance fee. 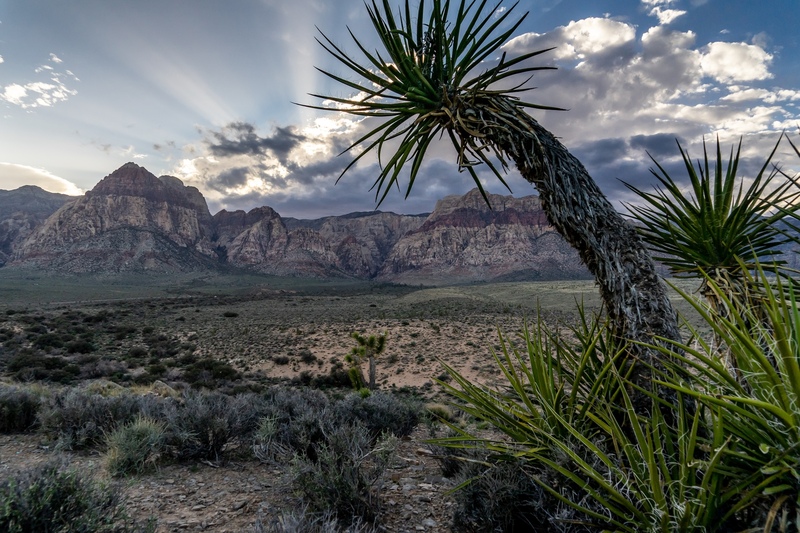 … the sun will dip behind the mountains to the west, on the opposite side of Red Rock Canyon. 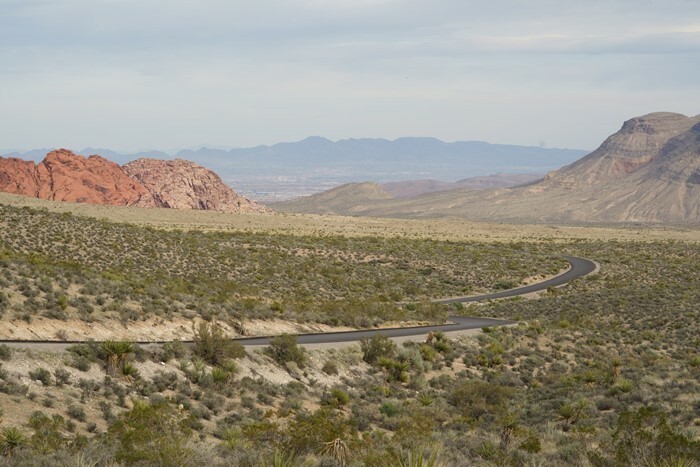 At Red Rock Overlook, there’s a short, paved trail that leads up to an observation point. 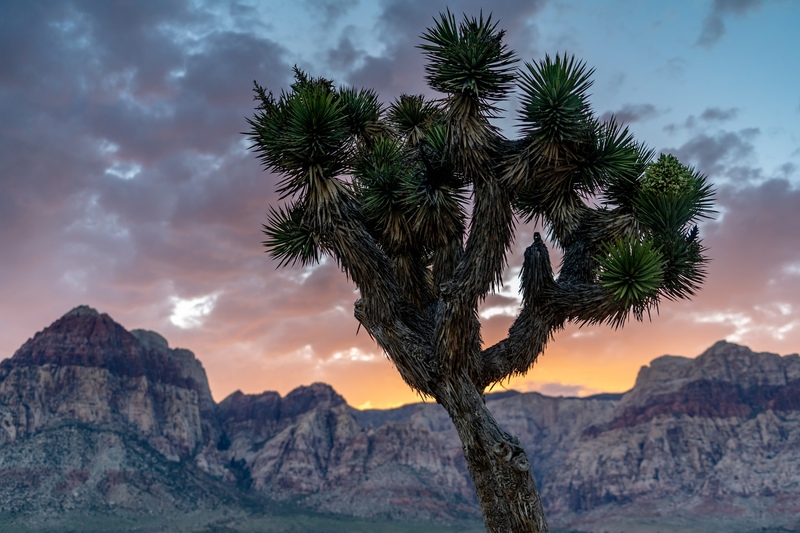 All along this trail, you’ll find cactus and Joshua trees that provide a great foreground for your photos. On the evening I was here, it was very windy, but there were some nice clouds moving over the mountains. If you’re here on a cloud-free day, this sunset probably won’t be very spectacular. But under the right conditions, you should see some beautiful colors! I ended up at Red Rock Canyon one last time, before sunrise on the final day of my short visit to Las Vegas. I decided the park itself might not have the best view of the sunrise, so I stopped outside the park, at the turnoff to Calico Basin. 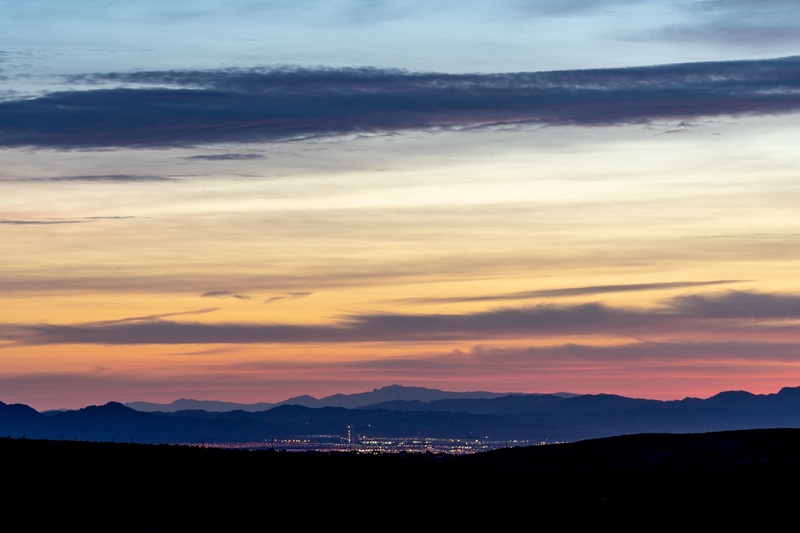 This spot gave me a good view to the east, and I could even see some of the lights of Las Vegas in the valley. The sunrise was spectacular! The moments after sunrise were pretty good, too. This is the road leading into Calico Basin (there are picnic tables and one hiking trail out this road, with no park admission required). Just imagine the view if you could hike up to Turtlehead Peak (in the middle) for sunrise! I loved every minute I spent in Red Rock Canyon. This scenic area was a great surprise and provided several days of good hiking options. And, there are still a few routes I haven’t tried yet, so I’ll be back!